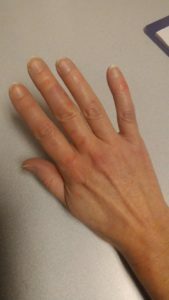 All four of my fingers are afflicted, but the most easily visible ones are the red welts on the middle and pinky fingers, particularly on the first joints. What happens is when the extremities are cold, the blood vessels constrict, restricting blood flow. If you warm up too quickly, the blood tries to rush into the vessels before they have a chance to expand. With nowhere to go, the blood will push through weak spots in the vessel walls and pool in the surrounding tissue, creating painful welts, swelling, itching. It takes about two weeks for the body to reabsorb the blood deposits. Until then, welts are hot, itchy, extremely painful to the touch. Surrounding tissue feels swollen and hard, sometimes tingly. Extremes in temperature in either direction increase the discomfort. Chilblains: literally swollen from the cold. Chill blain. On a side note, these are so uncommon in the US because of widespread central heating and modern fabrics in gloves, socks, and shoes, that it took me years to find a doctor who not only recognized what they were but who had even heard of them. But they were common before the advent of central heating. The scourge of Victorian governesses and scullery maids. This entry was posted in Writing and tagged chilblains, historical fiction, research, writing, writing research. Bookmark the permalink.